May 26th, 2011What is your Birthstone? Do you know what’s your birthstone? I think I know what mine was before, but forget all about it. hehe. Anyway, when I had Caity’s ear pierced during our PH vacation, I wasn’t able to bring her earrings. Fortunately, the clinic was selling earrings. They suggested to choose a pair with her birthstone. Good idea! Since she was born on August, her birthstone is Peridot. My past birthday, I was thinking of getting a ring with my birthstone on it – a gift for myself? Why not. It would be nice to wear a real, sparkling gem on my finger as opposed to the fashion rings I’m wearing. teehee! After many unsuccessful clothing purchases, I almost gave up on online shopping. Most of them were too big for me, others just don’t fit me well. Sigh…if only international shipping isn’t expensive! Sadly, I didn’t have any other option but to give it one more try because I really can’t find any maternity jeans here in Prague that will fit me. Petite pregnant women who are in the US are fortunate coz they have many choices when it comes to small-sized maternity clothing. Anyway, I got hold of my order from last month yesterday and I was very, very happy coz it fits me to a tee! I should have bought plenty but well, I didn’t want to take the risk since I wasn’t sure yet if it’s right for me. But now that I already know what’s the exact size that fits me from this store, I can always add more later. After many tries and errors, I can say thanks to online shopping! From clothing to industrial supplies , electronics to baby stuff, and everything else, you can find whatever it is you’re looking for (as long as you know how to search). 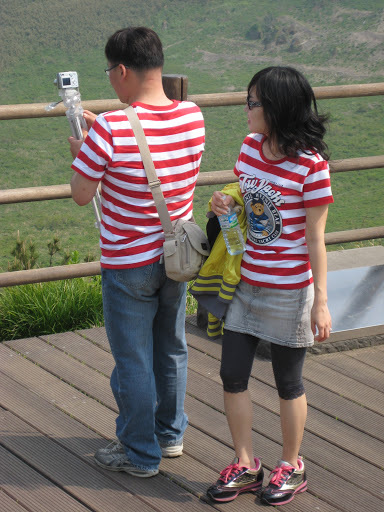 I can’t seem to get enough of how Koreans match their clothing with their partners. But do you know that the trend doesn’t end with couples alone? It has branched out to families! Isn’t it cute to see the whole family wear similar clothing? Okay as long as the children are still babies or toddlers, I guess it’s cute but once they’re old, they’d look like a sport team if they all wear the same outfit. =) And I’m sure once the kids are old enough to choose their own clothes, I think parents will have a hard time dressing them up the way they want them to. Because for two days I’m back indulging in one of my fave past time, that is watching Korean drama, I remember what I’ve noticed during our 7 hour stop-over in Seoul airport last November. It was quite a long stop and to kill time, I was people-watching, while of course cautiously watching and following little C wherever she went. 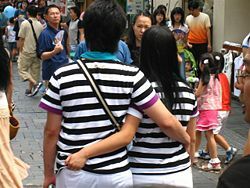 I met many Korean couples who were wearing matching clothes – tops, pants, shoes (whatever they could think of matching!). There were those that wear exactly the same shirt print and color. Some wear matching styles or the same design but of different colors. I also saw a couple wearing the same pair of rubber shoes. It was really cute to look at. Too bad my camera wasn’t with me; I could have stolen some shots for you all to see. 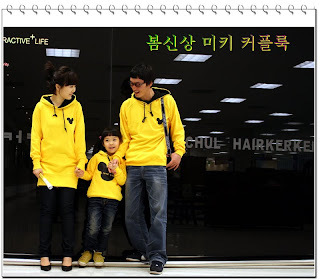 Nonetheless I got lucky when I googled “Korean matching attire” and found some pictures with couples wearing matching clothes. Anybody who knows how this lovers’ fashion trend started and became popular in Korea? What’s with teens and black? Have you noticed how teens especially guys love to wear black shirts? Does it have to do with machoism mindset? So I asked one and I was quite surprised with his answer. He likes wearing black shirts coz they camouflage the dirt. Haha That was one very reasonable guy! Anyway, I bet most teens would love to shop for shirts and hoodies at MMA Clothing. Their designs would fit the macho image they want to have; skulls, chains, helmets… hmmm sounds warrior-like, right? As for the Zena-inspired gals, the designs come in feminine colors of red, pink and white so they don’t feel too barbaric and scare guys away! LOL!